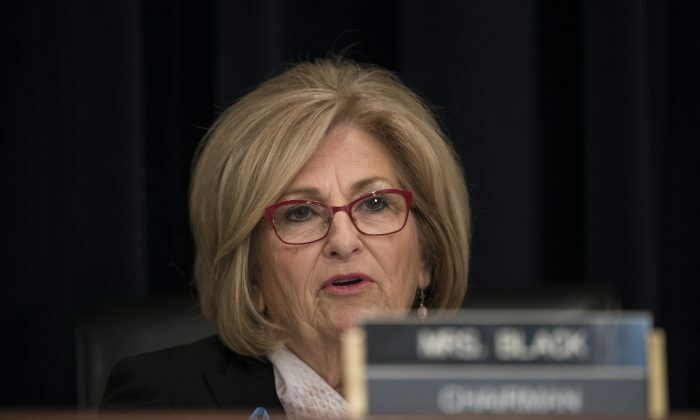 A man was arrested and indicted by a federal grand jury for allegedly making death threats toward Republican Congresswoman Rep. Diane Black. The suspect, identified as Clifton Ward, threatened “to assault and murder” the congresswoman, who is running for governor in Tennessee, according to an indictment filed on June 26 in the U.S. District Court in Chattanooga. The threats reportedly came soon after Black introduced a Border Wall Trust Fund Act on May 18, that would create an account at the U.S. Treasury to collect funding for President Donald Trump’s planned border wall. The violent threats were made with the “intent to impede, intimidate, and interfere with Congresswoman Black while she was engaged in the performance of her official duties,” the indictment said. Ward left the threats via voicemail at one of Black’s district offices, according to officials. Black did not immediately respond to a request for comment. House Majority Whip Rep. Steve Scalise (R-La.) offered his support to Black on Twitter, saying the current rhetoric was not beneficial to anyone. I’m glad my friend, @RepDianeBlack, was not harmed,” he wrote on July 26. These threats of violence have to stop. They are not an acceptable way to express political disagreements. Scalise was the victim of a politically motivated shooting at a Republican baseball practice session last year by Bernie Sanders supporter James T. Hodgkinson. He was hospitalized with severe injuries to his hip, left leg, and lower organs. In recent weeks, an increasing number of instances of violence and harassment against both supporters of Trump and members of his administration have been reported. Such violence has been emboldened by comments made by prominent Democrats, notably Rep. Maxine Waters (D-Calif.), who on June 23 incited people to “create a crowd” and harass officials in public. “If you see anybody from that Cabinet in a restaurant, in a department store, at a gasoline station, you get out and you create a crowd and you push back on them, and you tell them they’re not welcome anymore, anywhere,” she said at a rally in Los Angeles. Last week, a teen visiting Seattle said he was harassed for wearing a red “Make America Great Again” hat, a symbol of Trump’s presidential campaign. Footage shows 17-year-old Ashton Hess walking with his family before being hit in the head, spat on, and cursed at by another man. However, death threats have also increased as a result of such rhetoric. Early this month, 75-year-old Martin Astrof, from Long Island, was arrested for threatening to kill supporters of Rep. Lee Zeldin (R-N.Y.) and the president. Astrof went to Zeldin’s campaign headquarters in the Nesconset, New York, area earlier this month and “became irate” with a campaign worker, Suffolk County Police Department stated in a release. “After threatening to kill the campaign worker and other supporters, Astrof backed his car up in an aggressive manner, nearly striking the worker,” the police said. He was charged with making a terroristic threat, a felony, and reckless endangerment in the second degree.